An uncommon musician, banjoist, and composer, Jake Schepps creates music for the traditional American string band that is anything but traditional. 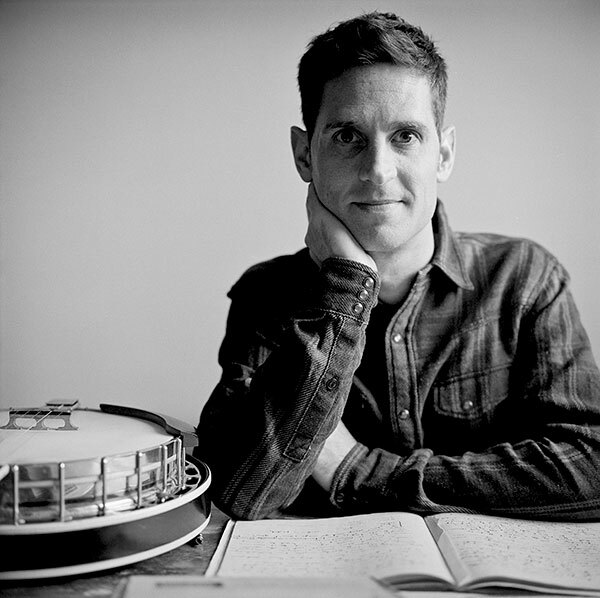 In 2015, Jake launched Round Window Radio, an innovative online music subscription series covering territory from bluegrass to Brazilian choro, jazz, classical and more - each revealed through the prism of the 5-string banjo. New releases each month offer inventive, exciting, and rich new music with a wide spectrum of accomplished collaborators. As a bandleader with the Jake Schepps Quintet, the Expedition Quartet, and now Round Window, he performs around the world, and has been featured at NPR’s Tiny Desk, Colorado Public Radio, eTown, and WNYC. Jake also has a love for teaching music, bringing a skilled and conscientious style to NimbleFingers, Berklee College of Music, Steve Kaufman Acoustic Kamp, British Columbia Bluegrass Workshop, University of Northern Colorado, and producing an instructional DVD Modern Banjo Ideas & Techniques. After many years of interviewing some of the world's greatest banjo players for Banjo Newsletter, and attending workshops in a spectrum of musical styles (the Banff Centre’s Workshop in Jazz and Creative Music, Valley of the Moon Fiddling Camp, the Centrum’s Choro Workshop, and Silk Road Ensemble’s Global Musician Workshop), this breadth of musical experiences have worked their way into Jake’s teaching curriculum and his open-minded approach to music. Banjoist, composer, and instigator Jayme Stone makes music inspired by sounds from around the world—bridging folk, jazz, and chamber music. His many award-winning albums both defy and honor the banjo’s long role in the world’s music, turning historical connections into compelling sounds. Stone is the consummate collaborator, unearthing musical artifacts and magnetizing extraordinary artists to help rekindle these understudied sounds. He is a passionate educator and has taught in many settings including the Silkroad’s Global Musician Workshop, Mike Block’s Fiddle Camp, Alasdair Fraser’s Sierra Camp, the Midwest Banjo Camp and the Berklee College of Music. A respected performer and teacher of traditional music, and a banjo player of uncommon grace and facility, Wesley Corbett began classical piano at the age of two. During high school he converted to the banjo and has spent the last 15 years studying, touring and teaching. Wesley has recorded and performed with numerous musicians, including Molly Tuttle, Joy Kills Sorrow, The Bee Eaters, The Biscuit Burners, the David Grisman Quintet, Mike Marshall, Darol Anger, Robert Earl Keen, Crooked Still, Sarah Jarosz, Tony Trischka, Alan Munde, and others. Wesley served as the professor and grant manager of the banjo program at Berklee College of Music between 2011-2015. He toured internationally with the critically acclaimed acoustic string band Joy Kills Sorrow until 2014 which was featured on NPR’s A Prairie Home Companion and Mountain Stage as well as in Rolling Stone. Wesley Corbett has more than 10 years teaching experience. He enjoys playing and teaching all styles of 3 finger banjo. With a vital fluency in Scruggs style, he is additionally adept in blending single string and melodic style within composition and improvisation. His music instruction focuses on enabling students to effectively practice on their instrument which in turn, fosters self-learning and creativity. He currently tours with the 2017 IBMA guitar player of the year Molly Tuttle. Gina Clowes Gina Clowes’ innovative and unique musicianship and songwriting, although based in traditional music modalities, breaks free from the assumed constructs and makes a new musical statement that's influenced by emotion, is played with the highest skill, and expresses an enormous verve and vitality. With an intent to use the banjo as a medium of personal expression, Clowes moves through varied modes of musical treatments. Although she's known mainly known for her work as the banjo player for Chris Jones and the Night Drivers, she has a long history with her banjo. Born and raised in Front Royal, Virginia, Gina began touring up and down the east coast in her tween years with her siblings, earning countless ribbons from fiddlers conventions, a strong reputation in the regional bluegrass scene, and a stamp from Bluegrass Today as “absurdly talented”. She later played in a number of regional acts (Blue Light Special, New Girls Nite Out, On the Run, Bud’s Collective) and has made her international touring exposure with Chris Jones and the Night Drivers soon after joining the group. She is sought after as a teacher privately and at camps across the country. Her new album, True Colors, was released in September 2017 and debuted at #13 on Bluegrass Billboard Charts. Gina was featured on the cover of Banjo Newsletter in the December 2017 issue, along with her original tune "Saylor's Creek"
Adam Larrabee is a seasoned banjoist, jazz guitarist, and composer who has appeared as a sideman on Bruce Hornsby’s recording “Spirit Trail” and who taught at New England Conservatory while performing in the Boston area for nearly 10 years. He was a founding member of the pioneering “newgrass” group Joy Kills Sorrow but is perhaps best known around the country as a banjoist with the bluegrass 80’s band Love Canon. His most recent project is composing 24 preludes in all major and minor keys for solo banjo for the classical banjoist John Bullard. Adam currently teaches classical and jazz guitar at James Madison University. His musical path has covered as much territory as his physical one. Reflecting his love of diverse genres like jazz, bluegrass, country, folk, experimental, and classical music, Ross has always felt at home with fellow musicians who seek to reconcile, through their music, the incredible wealth of styles available to listeners in this global and digital age. Ross, along with bassist Eric Thorin, has been a member of the Matt Flinner Trio for the past eleven years. Known in acoustic circles for his groundbreaking mandolin work, Matt developed a unique concept for the group: All three band members write a tune each day while on tour and perform it that evening. After several tours, they picked twelve of their favorite tunes and recorded them. The result was “Music du Jour” which was released on Compass Records in April, 2009. Since then, the Trio has produced two more recordings of Music du Jour compositions: “Winter Harvest” (2012) and “Traveling Roots” (2016). Ross’ solo album, “Volley”, features his original compositions and electric guitar playing. He also recently released a duo recording with acoustic guitarist Grant Gordy titled “Year of the Dog”. He performs frequently throughout the New York City area, and tours nationally and internationally with various projects.